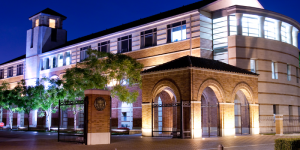 The USC Marshall full-time MBA primarily offers daytime classes. The program can be completed in 20 months. USC Marshall offers one intake per year, and classes begin during the fall semester. Students in their first year complete core courses in the first three terms. At the end of the first term, students begin a professional consulting assignment in Los Angeles. During the summer between the first and second year, students participate in an intensive course that includes a 10-day field trip to selected companies and institutions in a leading Pacific Rim, Latin American or European city. The USC Marshall full-time MBA is a 63-credit program comprising a core curriculum of 31.5 credits and 31.5 elective credits. The core courses are Strategic Formulations for: Competitive Advantage, Financial Accounting, Communications, Microeconomics, Statistics, Org Behavior, Info Systems, Corporate Finance, Marketing, Macroeconomics, Strategy, Managerial Acct, and Operations Management. USC Marshall offers close to 100 elective courses for MBA students in any given year. Second-year electives are offered at various times throughout the day and evening. Students generally select a primary concentration in a functional discipline — such as marketing or finance — and a secondary concentration (an industry “vertical”) that is related to a specific job focus, such as healthcare or real estate. A unique element of the course is PRIME International Experiential Learning, a required 10-day site visit overseas. Students visit selected companies, both domestic and multinational, and governmental institutions. Teams complete industry- and company-oriented recommendations in capstone projects that incorporate concepts from global strategy and global economics. The USC Marshall full-time MBA class is one of the only top-ranked programs in the world that has a majority of female students, at 52 percent compared to 48 percent of the class comprised of male students. The incoming class scored an average GMAT of 705 and enrolled with a GPA of 3.5. Students, on average, are 28-years old and have five previous years of work experience. About 30 percent of the class is comprised of international students, and 21 percent of the class is comprised of underrepresented minority students. An estimated 93.6 percent of USC Marshall grads were employed within three months of graduation, earning an average starting salary of $118,110. The average signing bonus, for graduates that earned one, was $28,406. Tuition for USC Marshall full-time MBA students is currently $62,140 and $58,316 in the second year. The total estimated cost for full-time students, including fees, books, health insurance, and more, is $98,955 in the first year, and $86,858 in the second. New and returning USC Marshall students have the opportunity to receive several merit-based fellowships. The Admissions Committee posits decisions about fellowship awards on a range of criteria, including: “scholastic merit, leadership, work experience and other characteristics that add value to the academic and social atmosphere of USC Marshall” as stated on the school’s website. Two-year awards range from $10,000 to covering the full tuition. Outstanding students who did not receive a fellowship upon admission to the program may be awarded the Second-year Dean’s Scholarships. Applicants to USC Marshall full-time MBA program must have a four-year undergraduate degree or equivalent. To apply to the Full-Time MBA program, applicants must submit a completed application form, all college transcripts from degree-granting and non-degree-granting institutions, a current résumé, and two letters of recommendation. The school also requires applicants to complete one essay about their leadership experiences and goals; applicants may also submit an optional essay for any additional information you wish to convey to the Admissions Committee. Applicants must also send in their GMAT or GRE scores (GMAT is preferred) and a nonrefundable $150 application fee. International applicants may need to submit TOEFL or IELTS scores with an application. All applications submitted after April 15 are reviewed on a rolling basis.